A well-made, intriguing conspiracy thriller. This is a pretty good movie, although it certainly takes a while to get going. The first portions of the film are interesting, as our writer is met by some opposition to him taking the assignment, followed by a quick and mysterious mugging. But then things get pretty low-key after that and stay this way for a while. When clues start appearing that something is not quite what it seems, the movie regains our interest. It does fall into familiar territory at times, (the ferry chase is right out of the Firm, with a trolley ride there,) but there’s a fantastic ending, including multiple surprises. It’s the kind of final act that keeps you thinking about it for days afterward, and sort of thing is well-worth the effort and the somewhat slow start. 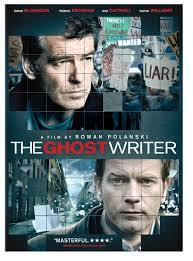 The Ghost Writer is an interesting and somewhat creative political thriller. It’s a movie that tows the line between what we know and what we don’t know. On the one hand, it’s similar in tone and structure to other movies in the genre. On the other hand, the movie does find ways to break the mold and become its own thing, mostly in the second half. The movie opens with shots of a car left on a ferry, unclaimed. Then we find the driver, dead, washed up on a beach. 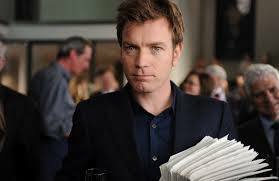 From here we meet the ghost writer protagonist of the film, himself, a man who remains nameless throughout the movie, (played by Ewan McGregor.) He is being propositioned to write a biography for the prime minister of England, a man named Adam Lang (Pierce Brosnan.) The previous ghost writer, who he will be replacing, was a man named Mike. This is the man who washed up on the beach, dead, at the start of the film. From the meeting with his publisher (John Berenthal, so good as Shane on The Walking Dead,) the writer goes straight to an interview in an office building. The man who leads him up makes it clear that he does not favor this writer, and once in the meeting, McGregor really has to sell himself for the project. He does so by talking about heart. He makes it clear that he is not a fan of politics, and as such, will be writing from the lay-mans point of view, focussing more on the relatable story and humanity then on the specific laws and political issues. The writer is given a manuscript to look over as he leaves the meeting. He gets into the street, starts walking, and is immediately assaulted and mugged. The men who attack him are on motorcycle and pull up behind him. They pop off just to strike him and steal the manuscript. This is some early excitement in the film, and unfortunately, it never gets explained. It’s a great scene, and the mystery angle to it is also pretty cool, but somewhere down the line in the film, it would have been nice to revisit it and get answers. The men clearly thought the writer had a copy of the biography that Mike had written, but who sent them and why they were after it is never resolved. Not to be deterred by the mugging, the writer continues on with the job and goes to Martha’s Vineyard to get to work. Adam Lang and his wife are staying in a small house on the beachfront there, owned by Rhinehart, the company that is publishing the book. The writer meets the staff and then sits down to start reading. He goes through everything Mike had written, and is not impressed. He basically figures that he needs to rewrite everything from scratch. Then he gets the call from his publishing company that they need it to be done in two weeks. Lang arrives, and we finally meet him in person for the first time, For an actor who is prominently placed on the posters and cover of the movie, Pierce Brosnan is hardly in this thing. That actually ends up working to the movies advantage, shrouding the character in a cloud of mystery. When he gets to the house, Lang sits down with the writer and tells him the story about how he met his wife and joined politics, both at the same time, on a rainy night, back in college. While all this is going on and the writer is working on the book, there is a scandal taking place in the media with Lang as the prime target. He is under investigation by the International crime court for selling out English citizens to the CIA to be subjected to torture. People were torturred. Many consider Lang to be a war criminal who supported the illegal kidnapping of his own people. Every time there’s a trip away from the house, protesters bombard the cars that are leaving. These people blame Lang for fallen loved ones who died overseas. He obtained information about terrorists illegally, and while Lang believes he did it in the interest of stopping terrorist Attucks and keeping people safe, for the men who were torturred, he clearly violated their civil rights. Things start to get good once the real mystery begins to unfold. It happens somewhere near the second half when the writer funds secret photos taped to the bottom of a drawer in the room that anime was staying in before he died. There are a couple of moments where the writer is looking at something (papers, dates, or writing,) and realizing something, and we are supposed to know what he is thinking. It’s a little annoying. The first time, it’s about dates that don’t match up. This is explained later, so we move past it. But then it happens again, when he comes across an article and video about connections with the CIA. On top of all of these findings, Lang also conducts his own investigation and finds an old man who lives on the beach DNS says there’s no way a body could have washed up that way. The man tells him about a woman who saw what happened and is now in a coma. The writer tells Lang’s wife, Ruth, that he is not an investigative reporter, he saw what happened to Mike, and he wants no part of pursuing this mystery. And yet that’s exactly what he does. He uses the GPS location that was last entered on Mikes car to find out where Mike took his last trip before being killed. This leads to a pursuit on the ferry between the writer and some faceless and anonymous hit men, that feels right out of other movies we’ve seen before. One example is The Firm with Tom Cruise escaping the men pursuing him, for digging a little too deep with his investigation, while on a trolley. The movie really builds up to something exciting, including a face off on a plane and then some final scenes that really help put things into perspective. The film definitely took some time to get going, and had plenty of avenues of familiarity, but once it finally broke free, it turned out to be something pretty cool.